Because of the odd shape with the hooks and “wiry” form of metal hangers, they get caught on recycling equipment cause massive damage to the system. This means they cannot be processed in the single stream recycling bin (aka your household recycling bin). That doesn’t mean they can’t be recycled though! You can take wire hangers to a scrap metal business who specializes in all types of metal, not just tin and aluminum cans like single stream. There are a few local scrap recyclers who may accept them, check with TJN or other outlets before trashing them. Many dry cleaners and thrift stores will also accept them as donations. Whether they’re the type of colorful, sturdy plastic hangers you use at home or the plastic/metal mix type of hangers used in stores, plastic hangers are nearly impossible to recycle. We can only recycle plastic bottles, tubs and jugs in the single stream- Plastic hangers do not fit into any of these categories so you cannot put them in your single stream bin. 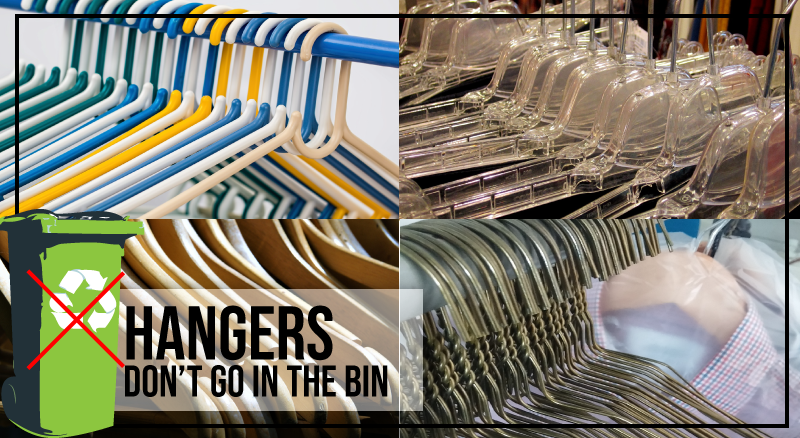 However, you can get the most out of your plastic hangers before trashing them by reducing and reusing. If the store leaves a hanger on the shirt when you’re checking out, kindly ask them to remove and keep it. They’ll be happy to keep it and reuse it for other clothing and you won’t have to figure out what to do with it when you get home. Most thrift stores also gladly accept plastic hangers to either bundle and sell or to hang clothes in their store. Wood hangers are not recyclable. The wood is treated with varnish or other types of finish, resulting in a non-recyclable product. Consider donating unwanted hangers to charities with lots of jackets, as wooden hangers ideal for these types of heavy material. As a last resort, if you cannot find any other reuse options or if your hangers are broken, please put them in your garbage can. They cannot be recycled in the single stream recycling stream and if they make it in the bin, they can really jam up the process. Thank you for recycling right! There are 0 comment. on "Hangers Can’t Go In the Bin"